That train unloading station is great, now that I understand how/why stack inserting sideways onto splitters works, but I still haven't worked out for myself how to make an even train loading station. I've got an iron mining and smelting station partially set up, I just don't quite grok how to split the inputs to each car. This is what I've got so far, and it obviously just fills the inner chests of each carside first, making loading when a train arrives slower overall. I've got some half baked fixes in mind but none of them work with six chests--powers of two and all that. 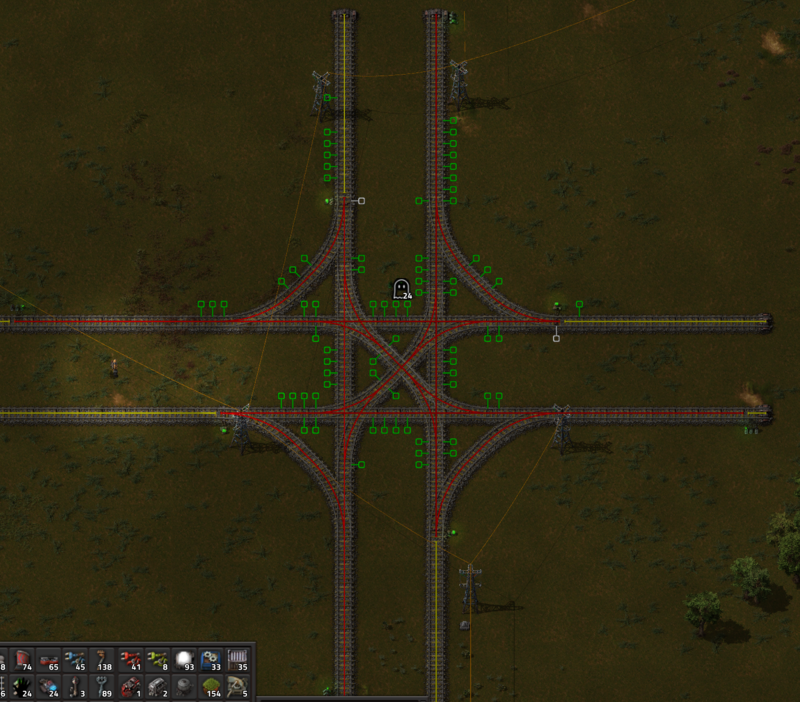 Also speaking of trains: I threw together and blueprinted this right-drive junction last night. Hopefully the four chain signals and four regular signals are visible. 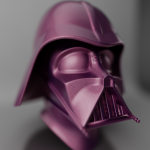 I messed about and it doesn't look like this'll cause problems; anyone think otherwise? There's a tutorial somewhere on the wiki, but with circuits you can make the inserter stop working if the chest has more items than the average of all chests balancing them. I had trains with three wagons and had to do this to make them not take ages loading. I guess I really don't get the advantage of the splitters in this design. It looks like the same basic belt side feed design that I hate except now it has splitters. The unload is slower because you're only using 8 inserters per car rather than 12. 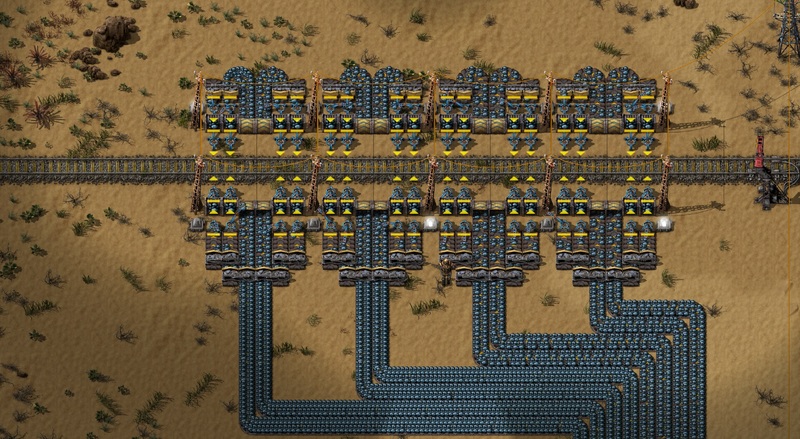 The "unload" is slower, but unless you are pulling extra belts (read: not compressed belts) then the bottleneck isn't the inserters, its the belts. I had a much more math heavy post, but didn't include it because its mostly irrelevant because when talking throughput only the current bottleneck is the issue. Standard 12 inserter station in .16 had ~154.32 items/s. -If one is pulling compressed belts there is no difference in throughput between the designs (belts are the bottleneck not inserters). -Theoretical inserter throughput drops by ~10%, but that's likely irrelevant due to break points of belts. -Easy and compact to pull all the belts off one side. The guaranteed way to balance a loading station (this is often overkill) is to run a 1:6 or 2:6 balancer per every side of each wagon or run a [Source belts: wagons*12] balancer. Basically treat each inserter as its own lane that needs to be balanced. There are some quick cheats that are better balanced and most often sufficiently balanced for use. I typically use 6 splitters to go 1:6, its not balanced but its sufficient. Alternatively circuit network such that checks relatively levels of the chests and only enables the more middle inserters when the more outside chests have => of contents. Or wire up all of the buffer chests, connect those to the station, and only have the station turn on when its buffer has enough to fully load a train. That intersection won't deadlock, which is most important. However because nothing else in the middle is signaled, its overall throughput will be severely hampered as only one train can use the intersection at a time. It looks like you'd really want to expand the intersection some to make room to signal. I'm not the best with throughput an intersections, but I'm 99% that a roundabout would function a whole lot more efficiently than that one. Can't speak to the loading station issue, but your junction is severely capacity-limited by making the whole interior just one block. With a few more internal signals, you could partition it and have trains move through at the same time if their movements don't conflict (trivial example: one train going WE, one going EW). The materials cost for additional signals is trivial in the long run. I'm using this loading station at the moment. I was frustrated with the same thing you are, where the ends would be starved of materials, so after looking around for ideas I cobbled this together and now it's my normal station (I'm sure there is something more elegant and better out there). The output of the mine goes into an X:8 balancer before feeding this station and it works very well compared to the unbalanced version I was using before (same as yours pretty much) even though it gives up total number of inserters. I tried doing it with green inserters and if I fed it enough trains it simply outstripped the ability of the mine to deliver ore so I just used the blue ones which keep my trains fed fast enough that my unloader buffers at the other end never go dry. I use very similar loading stations but instead of using green inserters to take off the belt, I use blues or even yellows depending on the influx. It's not perfect by any means but does a decent enough job. Commander Keen is my hero. A friend of mine did a whole thing with the six chests linked up via one color to the input of a Math Combinator, dividing the signal by the number of chests, whose output was sent along the same colored wire to the inserters loading into the chests, which were additionally individually wired by the other wire color to their neighboring chest. They were only active if the contents of their chest were less than the divided value plus one or two. It seemed like an awful lot of work for "balanced loading," but it worked pretty well! Once you blueprint that, you don't have to worry about the wires as they're free in blueprints. One thing to watch out for this is that if your supply exceeds the ability of the inserters they will take from the left lane by preference. There's no point feeding this with four belts, that's just what my testing setup already had and I forgot to prune it back to two. The only trouble is only one train can use the intersection at a time, ie two trains going East-West and West-East can't pass each other. My roundabout (up the page a bit) allows both lateral passing as well as right-handed turning pairs. I thought only one train being in the intersection at a time was the whole point, but yeah there's no reason for E/W to be blocking each other. Do roundabouts have throughput problems of their own? I’m continually amazed by how much more fun this game gets the more I do. I’ve been going train crazy on this run, and also I started using roboports with logistics bots for the first time. It’s like a whole new game. It’s so crazy fun making robots build my base while I go scoot up a build track making my personal robotport bots build the way to the next mega mine to support the ever expanding base. Like I’m positive at this point that Factorio is in my top 5 all time favorite games. I hope they do some DLC or something so I can give them more money. This game is easily worth $60, but nah, $30 forever. There should only be one train in each separate place-where-two-tracks-cross but there's like 16 of them. If they were all separate it would be possible to have four trains turning right at once, two turning left, E/W or N/S at once, etc. Roundabouts kind of have the exact same problem -- only one train can be going through the loop at a time so with heavy traffic they'll get congested. How dangerous depends on train length, routes and so on, but this deadlock can also happen when there's no turnaround for either train and just two simultaneous left turns. It probably wont happen often unless the train network is both very busy and has a lot of routes where long trains cross over, which isn't typical in Factorio where your trains are usually all going to or from a central hub. Anyhow, to be safe in general you need to use chain signals for signals that are inside the roundabout itself, same as for internal signals in an intersection. Internal chain signals will still allow trains to pass and allow simultaneous right turns, but they mean entering trains will reserve the entire roundabout for U-turns and 3/4th of it for left turns which slightly reduces throughput when these things happen. Since you need to use chain signals inside both roundabouts and intersections unless they're large enough to park entire trains there's not a lot of difference in performance between them. If you use chain signals properly (replace all the regular signals around the inner loop), that deadlock will never happen. The second train will just brake and sit outside the roundabout waiting for its path into and out of the roundabout to be 100% clear. Perfectly safe, just a little bit slow and inefficient if lots of trains need to get through at once. It was perfectly signaled when I blueprinted it the first time, a year ago when I knew how signals worked. I pull extra belts. 3 blue per car with the underground belts for one-sided output. 12:12 balancers aren't really worse than anything else because above 4:4 (aside from some oddballs I use a lot) I'm just going to use a blueprint for it. Here's a nice guide to rail signal stuff. Basically, if the signals on the intersections are right, the only jams you can ever possibly get are the ones from just having more trains than the tracks can handle, like if you have so many trains lined up to get into a station that the line overflows back through an intersection. If you want a roundabout with throughput similar to a standard X intersection you have to make the circle twice as big as you think you do; it must have a separate train-sized block between each exit around the circumference to avoid blocking as the pic above shows. Here's a link from someone who developed an automated testing tool and he shoved a ton of different designs through it. I use 2-lane "Compact" myself which is the most space-efficient high-ish throughput option. They're sorted by throughput so the ones at the top (generally larger footprint) perform better. There are 'buffered' roundabout options but as you can see by throughput they really aren't that much better than standard intersections in most normal games but non-buffered ones are just straight worse. I'm not understanding you. If the supply exceeds the inserters ability, then the belts would all be fully compacted and all inserters would be jamming stuff into the buffers as fast as they possibly could. What am I missing that you are referring to here? Chain signals go in front and inside any place where trains can absolutely never stop. Regular signals go at the exits of intersections. Follow these rules and you don't even need to understand how they work. 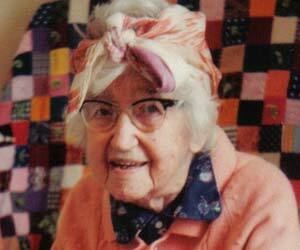 "You can build rails outside your normal build range as long as you start inside the range." I understand it says that while placing rails you have a longer range, but I'm having a hard time understanding the comment about what that limit or range is. If you click too far away with an inserter or assembler or belt or whatever it'll just say "can't reach" and you'll have to walk closer. But in rail-building mode, as long as you *start* at a spot in reaching distance, you can just scroll the camera and keep placing rails forever. I'm still working on my distributed manufacturing base and realized I wasn't pushing green chips as much as I needed to be, so I built a new manufacturing plant for them. 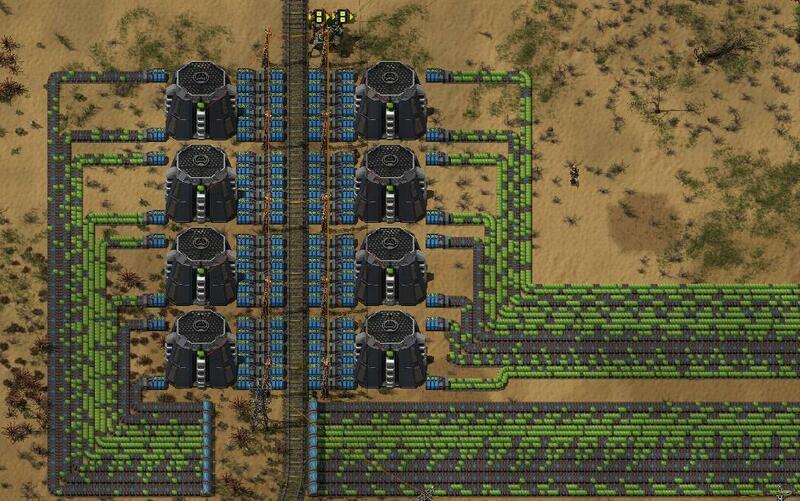 At full steam, I can push 16 blue belts of green circuits and 47k/second. Now I need to overhaul my copper plate plant in order to keep up. I have no idea what those structures at the.. loading? Unloading? thing in that last screenshot are, I've never seen those large structures or the blue things where I would expect inserters to be. Edit: Also what is the point of something like that? Just doing it to see how much you can do? The large structures are angels warehouses, extremely large chests, basically. And the blue things are some variety of loader, which are basically a thing that fills belts from structures or structures from belts, depending on which way you connect it. I recently got recommended them and they're extremely useful for some things like loading/unloading entire belts of stuff. Ok, so I assume that I'll not see either of those things in my vanilla game then. Thanks. Is there a mode I can run that I can just build things and spawn in chests full of items and things? The point of the ridiculous levels of production is purely post-game research. For example, currently I can research robot speed 13 at a cost of 64,000 of each science as well as 64k minutes of time. In order to be able to hit that without spending days of game time, I need absurd levels of production. I'm thinking about moving my production to the southwest (because i didn't know what I was doing, and now my first base has become a confusing mess). 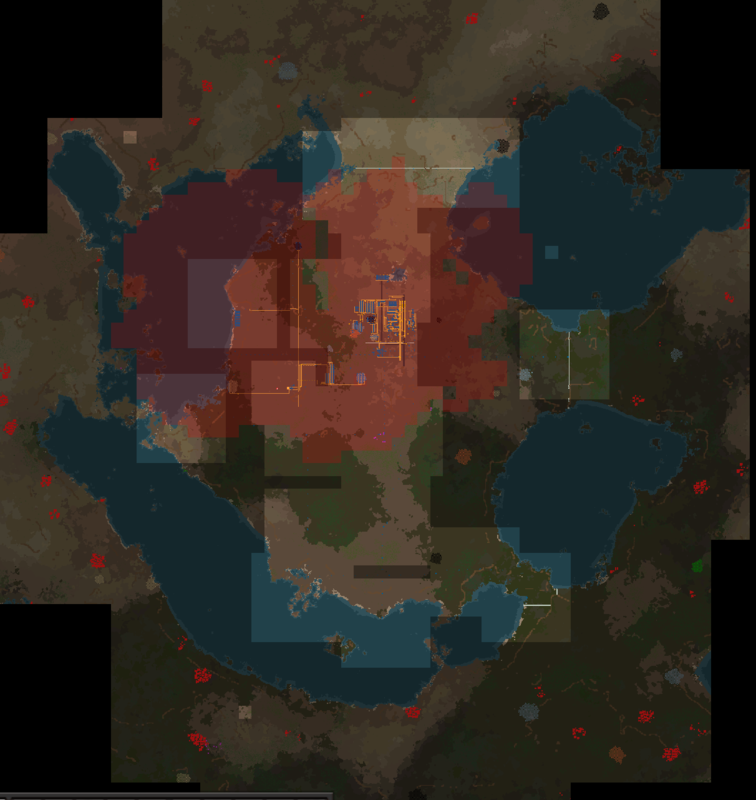 Will the western biters get stuck on the water, or will they find a way around that? 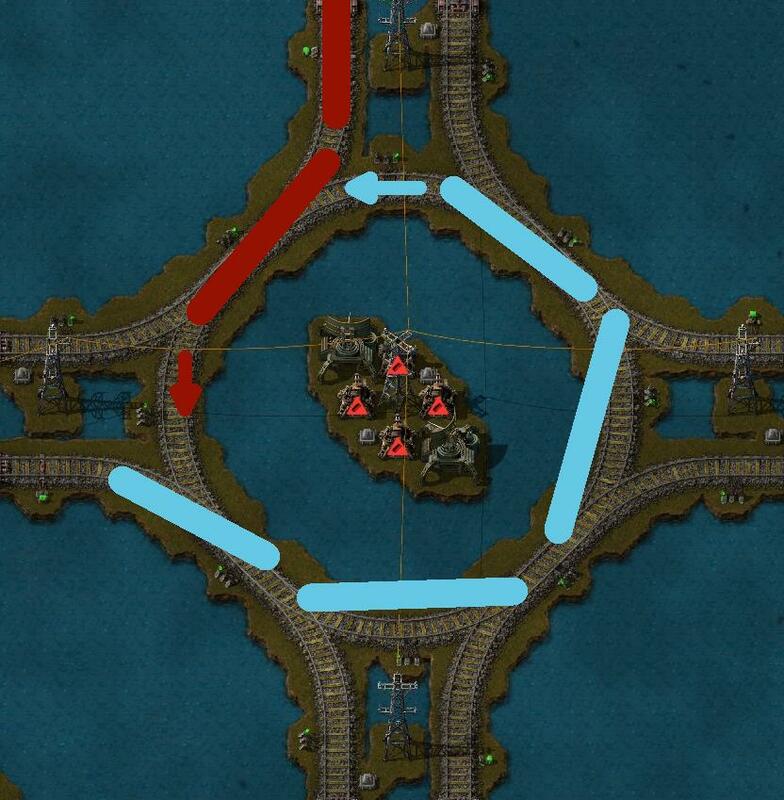 Assuming you cannot actually cross that bit of land that looks to connect your starting area and the western landmass then since you have every other way walled off they will be stopped by the water. You will end up with compacted belts on which the right lane doesn't move, only the left. This may be an issue, depending on what is feeding the belts. Ah, ok. So I would only think that would be an issue if there wasn't a balancer between the mine and the loader. Since I have a balancer then it should still pull reasonably equally from the mine itself over time I think? Thanks for that information though, more stuff to think about! So speaking of train loading/unloading, is there a furnace to train car ratio or anything like that? I just set up a big ol' iron outpost and figured I might as well smelt on site and train plates in, all told I have 192 electric furnaces (no modules/beacons yet) working with full ore belts. I originally thought this should be a two train affair, but after setting it all up it's taking a long time to load and plates aren't even getting down the belt to the lowest car. Specifically, you'd need a lane balancer on each belt. 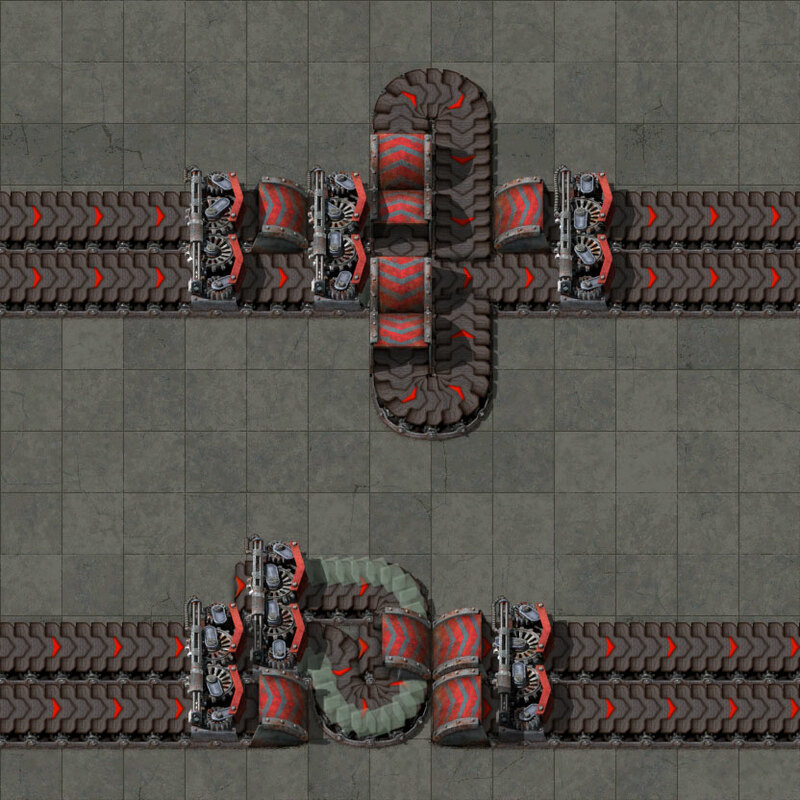 Normal belt balancer blueprints only ensure that all the belts have equal traffic, without necessarily doing anything about the left vs right halves of the belts. The ratio is going to depend on a lot of variable stuff like how often the train visits. 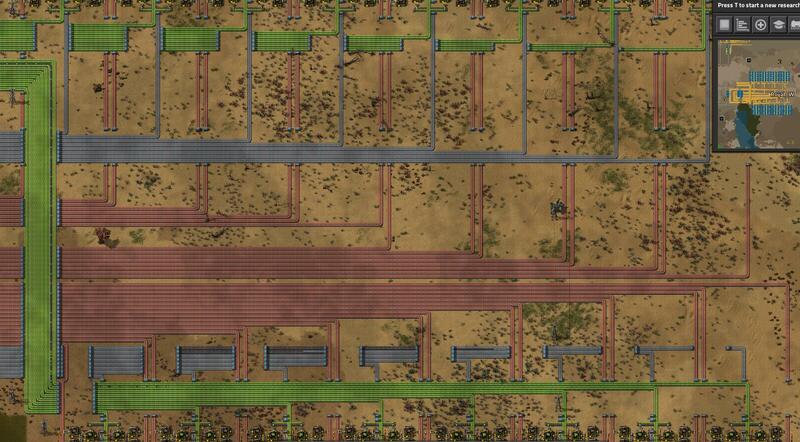 But as long as you have enough furnaces to feed whatever's using the iron at the train's other end it should work out. Do you have buffer chests? Stack inserters can work a lot faster moving stuff from a container to a container, since they can grab a full stack of items instantly instead of needing to scoop them 1-by-1 off a belt. Loading will go a lot faster if you load from the belt to chests 24/7 and then just load the train from the chests when it arrives. If you can't fill up the buffer chests again before the train returns, you probably do need more furnaces. 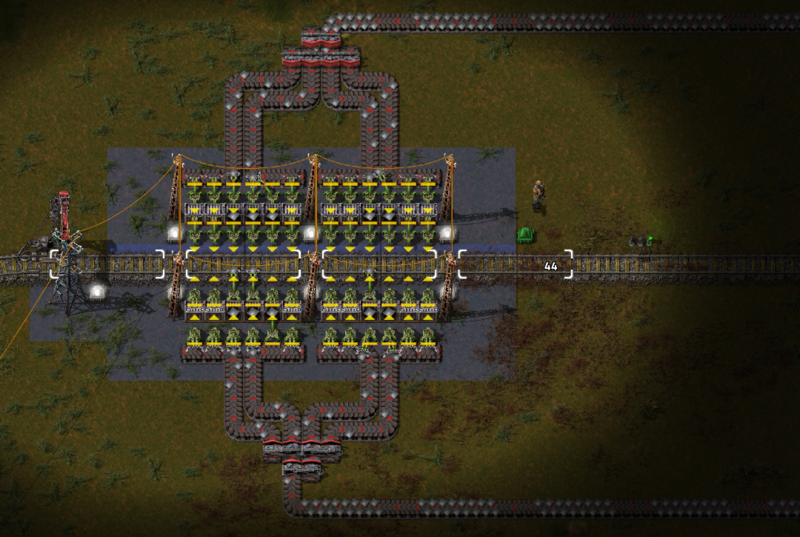 Also, try to use splitters and balancers to load each car equally. Ah, gotcha (insert light-bulb above head here). Thank you. I still haven't worked out for myself how to make an even train loading station. 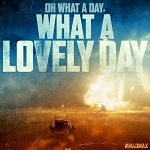 This is what I'm doing. 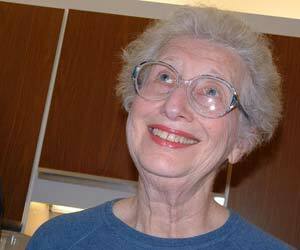 The hell if I know if it maths out to be even. I run each mining belt to one input of a splitter up to halfway up the loading area, and then plug them into the farside input of the other half of the splitters. Not sure if I can figure out how to phrase that better. They each accept 1-2 belts and output 1-2 belts with balanced lanes. The upper one is slightly bulkier but has the benefit of only trapping four items permanently, if this is a thing that bothers you. The lower one traps 24 items, as shown by the two lines of perfectly generic objects. The only bottleneck on throughput is that they can only make one belt lane's worth of items swap lanes, but this generally only becomes an issue if you're emptying both output belts from one side only and feeding both input belts on the other. Note that this does not mix the upper two belts with the lower two, add a conventional four-belt balance afterwards if you wish to do that.